More than 41% of Americans are vitamin D deficient, which means nearly half the country’s population is not absorbing calcium as well as they should be. For decades, health professionals have been touting the importance of incorporating calcium and vitamin D into a well-balanced diet to support better bone health. And for good reason, too. Without either of these two nutrients, your bones would wither away to nothing. We’ll take an in-depth look at both these nutrients and why calcium and vitamin D alone might not be enough on their own. Let’s kick things off calcium. Calcium is the cornerstone of bone health, and the numbers don’t lie. The Nutrition Business Journal reported Americans spent nearly $2 billion (yes billion, with a B) on calcium supplements in 2016 alone. Calcium is a crucial ingredient in your bones, and without enough, you can lose serious bone mass. Calcium has also been known to help prevent or improve conditions like high blood pressure, colorectal cancer, kidney stones, and excessive weight. What’s more, your muscles, nerves, and heart require calcium to function properly. If enough calcium isn’t consumed through food or supplements, your body will actually leach calcium from your bones to make up the shortfall. Then it gets redistributed throughout the body to help various organs keep doing their jobs. If you’re calcium deficient — formally known as hypocalcemia — it can cause a variety of issues, ranging from the benign (weak hair and brittle nails) to the truly troubling (memory loss and seizures). For more, check out our in-depth post on The Benefits of Calcium. If the “got milk?” ads of the mid-90s and 2000s led North Americans to believe anything, it’s that a glass of milk a day is as good as an apple at keeping the doctor away. So if that’s true, why is it so difficult to maintain healthy calcium levels? Well, for starters, your body doesn’t naturally produce calcium, so it has to be introduced through diet and supplements. Which sounds easy enough, right? Well… No. See, that’s where it gets confusing. The western world suffers from what’s known as the “Calcium Paradox”. Meaning, we tend to consume the most total calcium in our diets, but somehow, we suffer from the highest rates of osteoporosis. Part of this is because the calcium we do get is often from animal sources, like milk or cheese. But studies show that drinking three or more glasses of cow’s milk per day may actually increase your risk of fracture. Thus, the paradox. 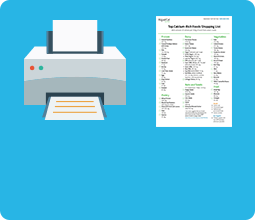 It’s so crazy, we dedicated a whole blog post to it. But dairy isn’t the only problem. Another reason we may suffer from higher rates of osteoporosis is, of all things, our produce. Yes, fruits and veggies, and it all has to do with our farming methods. Studies have even pinpointed why. Because of our continued use of inorganic fertilizers and harmful farming methods that lead to topsoil erosion, microorganisms and trace minerals like calcium are quickly disappearing from our soil and the food it grows. In fact, in the US alone, topsoil is eroding 10x faster than it’s building up. It’s estimated that by 2054, we won’t have to worry about low nutrients in our topsoil because there won’t be any left to worry about. Needless to say, these are concerning figures. The same study also investigated the true drop in mineral quality in our soil. What they found was shocking. Your average head of lettuce, tomato, or handful of spinach has about one-eighth the amount of nutrients it had around 100 years ago. So you’re getting about 12.5% of the nutritional value that your parents enjoyed from the same amount of produce. All this lack of calcium and trace minerals spells trouble for your bones. And this is why weak bones are so prevalent now. Of the estimated 10 million Americans with osteoporosis, roughly 80% are women. In fact, North American women have the same likelihood of breaking a hip as developing breast, uterine, and ovarian cancer combined. So make sure you’re getting enough calcium from both dietary and supplementary sources every day. Now, what about vitamin D? As we mentioned, vitamin D promotes the absorption of calcium and helps create other proteins important to calcium’s uptake in the body. But you may not have known how instrumental it is to other critical bodily functions. First, vitamin D assists cell differentiation. That’s important because differentiation is the process by which cells become specialized for certain roles. Plus, differentiation guards against cell mutations which can lead to diseases like cancer. Vitamin D is also a safeguard for your immune system. There is plenty of scientific evidence that vitamin D has several different effects on immune system function that may enhance your immunity and inhibit the development of autoimmunity. The active form of vitamin D influences insulin secretion when more insulin is needed by the body. So having too little can affect insulin secretion and glucose tolerance in type 2 diabetes. That said, more research is needed in terms of vitamin D and diabetes. With low vitamin D levels, you could be in for more than just wonky insulin levels and bone troubles. Since it’s a help to your immune system, your health could be compromised with too little vitamin D. Among other things, it puts you at higher risk of infections. You may even feel the effects of low vitamin D before they advance to bigger problems. For instance, you could experience foggy thinking, unexplained fatigue, and muscle weakness. Be on the lookout for this, and we recommend getting a vitamin D test to know for sure where you stand. The critical role vitamins and minerals play can’t be overstated. They work hand-in-hand to control all of your body’s main functions. And the dynamic duo of calcium and vitamin D is no exception. For more, check out our in-depth post on The Benefits of Vitamin D.
When together, vitamin D works as fuel for calcium absorption. After calcium is ingested, it’s broken down in the stomach. Ultimately, it’s absorbed into the bloodstream and distributed throughout the body as needed. Adding vitamin D into the mix allows more calcium to be absorbed through the intestine, so more calcium can work its way to your bones. Studies have found that vitamin D supplementation, on its own or combined with calcium, is able to reverse vitamin D deficiency, prevent bone loss, and improve bone mineral density in seniors. Because it aids in absorption, it also plays a role in reducing the risk of fracture. A trial of 2,686 seniors between the ages of 65 and 85 were given 100,000 IU of vitamin D3 once every four months for five years. The results? The inclusion of vitamin D3 substantially reduced the risk of any new fracture by 22%. Reducing the risk of fracture from a fall is great, but reducing the risk of falling in the first place is even better. A great first step to keeping yourself upright and mobile is to check out our Fall Prevention Checklist. There we talk about the major causes of falls, how you can work to prevent them, and what to do in the event you do take a tumble. You know the importance of vitamin D in helping your body absorb calcium. But this nutritional team helps far more than just your bones. On the weight loss side, there have been several studies the last a few years showing a connection between weight loss and supplementing with calcium and vitamin D. One major study was recently published in the journal Archives of Internal Medicine by Women’s Health Initiative. This study suggests that women who had reached menopause might be able to reduce weight gain by increasing their intake of calcium and vitamin D. The theory is that increased calcium and vitamin D affects how the body breaks down and stores fat. It’s been suggested these two nutrients can also affect cancer cell growth. Two major recent studies show convincing evidence that an increased intake of calcium and vitamin D reduces the risk of cancer. The first of these studies was a 10-year study that associated a lower risk of developing premenopausal breast cancer with women that consumed a diet high in calcium and vitamin D.
The second of these studies were released in the American Journal of Clinical Nutrition. It concluded that a higher intake of vitamin D and calcium reduces the risk of developing cancer. 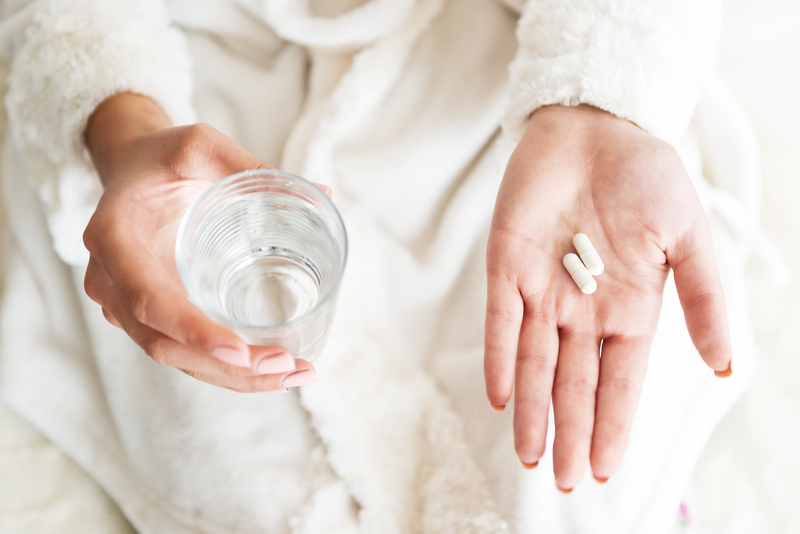 This four-year study involved women supplementing 1,500 mg of calcium and 1,100 IU of vitamin D daily compared to a group of women taking a placebo pill as a control. Since our bodies aren’t able to create vitamin D on their own, the next best place to turn is nature. Vitamin D is available freely from the sun, and in some foods. For a full list of daily value amounts included, view this page on sources of vitamin D.
Ultimately, the best and most important source of vitamin D is the sun. You’re much more likely to get the proper amount of vitamin D from the sun than you are from a food source. That’s because the sun’s UV rays act as an on switch for vitamin D production in your skin. For those living close to the equator, this shouldn’t be a problem, but it’s a lot easier said than done for countless residents of the northern hemisphere. 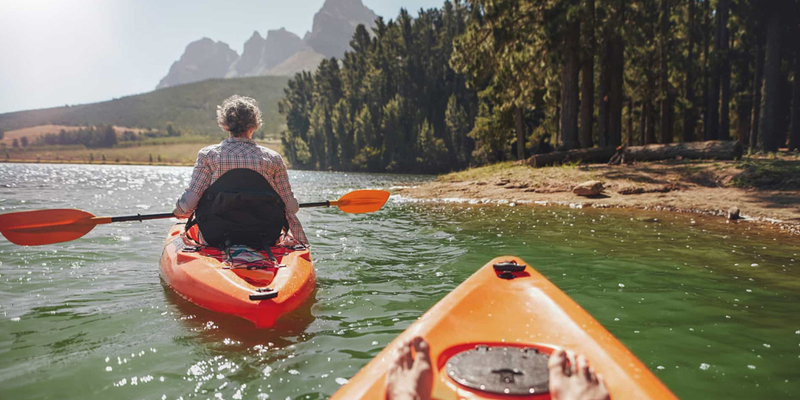 The sun isn’t always readily available thanks to latitude-related long winters, chronic overcast skies, pollution, and even shift work plays a role in a person’s ability to soak up adequate UV rays. If you aren’t able to get the proper sun exposure or eat enough vitamin D-rich foods, the best thing you can do is supplement. And when you go this route, it pays to know what to look for in the best calcium and vitamin D supplements. Like anything you put in your body, it’s always best if you can get your calcium and vitamin D from an organic source. Your body wasn’t designed to naturally handle artificial ingredients, chemicals, and other additives found in our food source these days. Needless to say, absorption of those rocks is rather… challenging. That’s why getting your calcium from a plant-based source is ideal. It’s natural, the ingredients come predigested by the plant, and absorption is much easier. Another important factor to consider when choosing a supplement is to make sure it has enough vitamin D. And true vitamin D in the form of vitamin D3 — not synthetic Vitamin D2 like some supplements use. Studies recommend a daily intake of at least 800 IU of vitamin D – however, more may be needed depending on the individual. A well-rounded calcium and vitamin D supplement will also have nutrients like magnesium, boron, and vitamin K2. That’s because your bones store 73 different vitamins and minerals, 13 of which are crucial to your bone health. So only taking calcium and vitamin D is just a drop in the bucket of what your bones really need. Another really important trace mineral for your bones is Strontium. 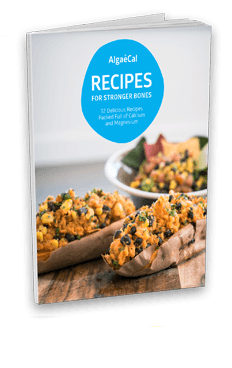 In particular, Strontium is key to building bone as it inhibits bone loss while increasing bone mass – an exciting double benefit! 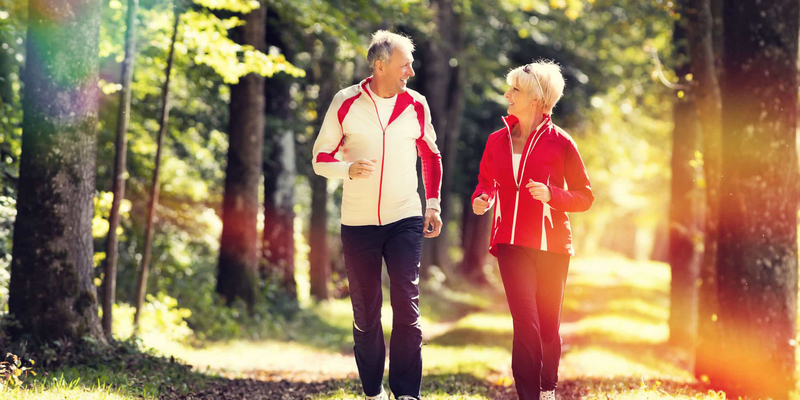 Finally, look for a supplement that’s backed by clinical trials and proven effective at not only slowing bone loss, but preventing it altogether. Finding a product that balances trace minerals with algae calcium is a difficult enough task, let alone finding one that has sufficient levels of vitamin D3 and has gone through rigorous clinical testing. But such a product does exist. And we call it AlgaeCal Plus. Derived from red ocean algae, our plant-based calcium has been proven effective in human clinical studies. It is proven to not only slow bone loss, but actually build new bone too. A claim no other calcium supplement on earth can make. The algae naturally contains 13 different trace minerals essential to bone health. Our formulation is rounded out with 1,600 IU of added vitamin D3 and can be partnered with Strontium Boost to create the Bone Builder pack. In a study published in the International Journal of Medical Sciences, the effects of three different AlgaeCal formulations on three groups of postmenopausal women were considered. After one year, each group increased bone density. The smallest average increase among the three groups was 1.3% — a significant figure considering most calcium supplements at best only slow bone loss. But what about beyond one year? Could AlgaeCal Plus and its ally Strontium Boost show proven bone density increases over several years? Researchers asked this question and set out to find the answer. 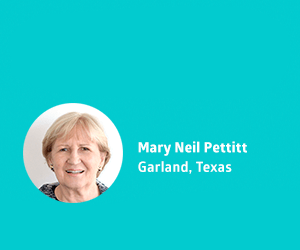 After seven years following 172 women in their 60s, they published their findings in the Journal of the American College of Nutrition. 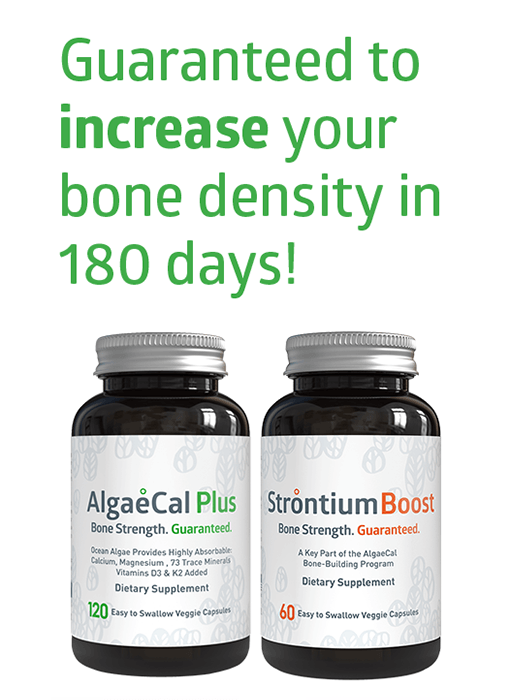 Indeed, after seven years taking the AlgaeCal Plus and Strontium Boost Bone Builder Pack daily, participants enjoyed a 1.04% average annual increase in bone density. 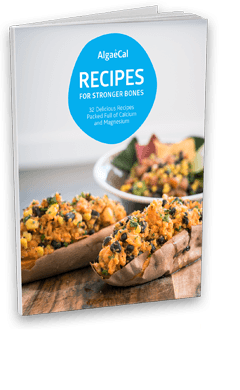 Keep in mind, people over the age of 40 lose an average of 1% of their total bone mass every year, so the Bone Builder pack not only stops that loss but actually helps build new bone. 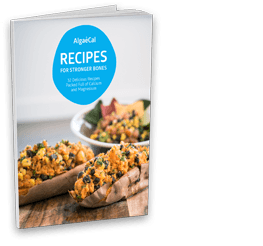 In fact, the Bone Builder Pack will not only increase bone density but can show gains in half the time of AlgaeCal Plus alone. It also increased bone growth 3x compared to AlgaeCal Plus alone in another study published in the Nutrition Journal. That’s the power of trace minerals combining with calcium. Ultimately, the best calcium and vitamin D supplement is one that includes a lot more than just calcium and vitamin D. Since your bones hold more than 73 different nutrients, it takes more than two to keep them healthy. "I can't wait for my bone scan in about 6 weeks. I want to see my doctor eat crow. "See what Mary's doctor didn't know!